Ok, yep, I hear you. I have to do the same thing. So how can we make the best of it? I can’t recommend creating a password that is so simple that it can be typed mindlessly over and over again. Password strength is a critical element in good IT Security. So what can we do? How about creating a password that can improve your life? One that can motivate you to greatness? Can this be done? p@yOFFvisaBY2015 See what I did there? This password will act as a constant reminder to “Pay off my Visa by 2015”. It’s a goal, something I want to strive to achieve. How about a few more? Will this work for all your passwords? Probably not. My recommendation would be that you use this model for the passwords that require periodic changes. 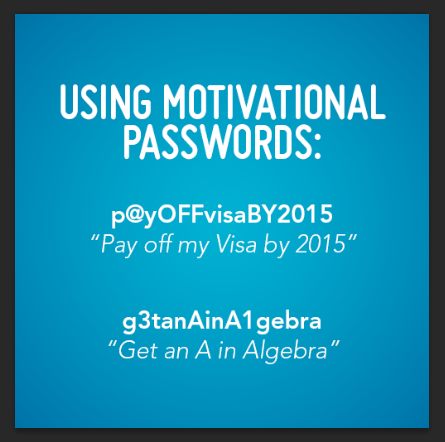 For example, if your password at work needs to be changed every 90 days, then use this for a 90 day goal. Passwords that are changed less frequently can be longer term goals. This is a simple trick. It may not be for everyone, but I challenge you to give it a try. datalossguru – thanks for re-sharing! The first example really caught my eye. Well written piece!